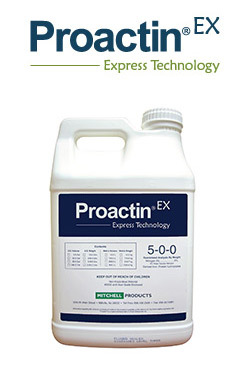 ProactinEX provides a cost-effective method for treating turf with a highly concentrated blend of nitrogen in the form of select L-form amino acids, B-complex vitamins, antioxidants, etc. in a patented biostimulant formulation (Express Technology) that provides for ready uptake. At a 40% active ingredient concentration and a low application cost, turf managers can now afford to treat all of their turf while customizing their nutritional programs with a highly effective product. Supplies nitrogen in the form of protein hydrolysates (i.e. amino acids) allowing ready foliar or root uptake by plants without draining energy from the plant. Helps turf better maintain its physiological functions like photosynthesis and enzyme-based metabolic activity.